This is an unbelievably beautiful thick rug. Colors are beige, with accents of rust and sage green. 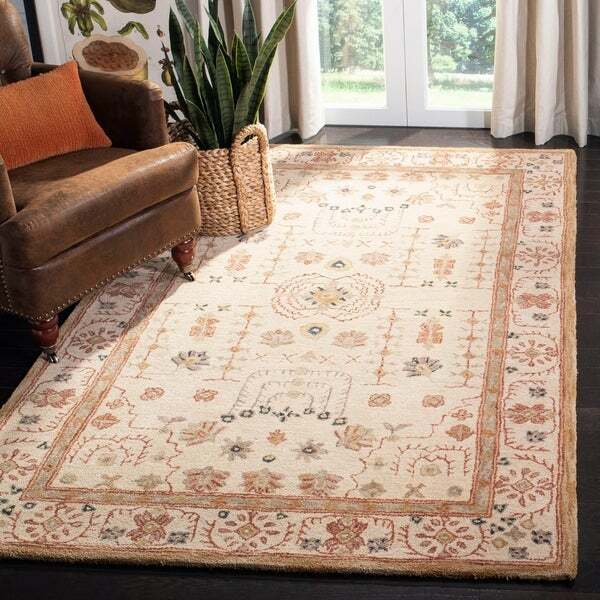 Safavieh Handmade Anatolia Oriental Treasure Sand Hand-spun Wool Rug - 9'-6" X 13'-6"
Tip: We recommend the use of a non-skid pad to keep the rug inplace on smooth surfaces. All rug sizes are approximate. Due to the difference of monitorcolors, some rug colors may vary slightly. Overstock.com tries torepresent all rug colors accurately. Please refer to the text abovefor a description of the colors shown in the photo. This rug turned out to be everything I was hoping for. I actually ordered the "anatolia sand" runner before ordering the 9'6" X 13'0" to make sure I like the quality and colors. FYI: The colors are the same as this "Treasured Sand" rug. The rust is a very dark orange red. colors in picture are accurate. One note: with this large of a rug they fold it into fourth to ship (rather than rolling it like most rugs). Be ready to unfold and roll it if storing for anytime. Folds seem to have come out fine, but we aren't putting the rug in place for a few months. We ordered this rug in November 2013. It shed a decent amount for the first 3-4 months (loose fibers everywhere), which we expected because it is hand tufted. The rug also had some blue ink spots on it (it was almost certainly a second) but when I brought it up to Overstock they gave me a good discount. Since the spots are barely noticeable, this was fine by me. The color goes well in our living room, accompanying a caramel leather sofa and oatmeal-y chairs. The dominant color is a light beige -- not at all as yellow or golden as it appears in the image -- and the other colors are a rust/orange, pale yellow, light sage green, and a light violet gray. Frankly, the color palette is not one I was looking for, but for the price we paid -- five hundred dollars, which is great for a rug this size -- I'm pretty pleased with it. Also, we didn't get a rug pad. It's a heavy rug and it doesn't slip at all, especially when anchored by our furniture. This is one of my best ever Overstock purchases. This rug looks ten times more expensive than it is. The colors and pattern are wonderful in person, and it looks fantastic in my bedroom. I ordered this rug on a Tuesday and it was delivered by Friday. The color is beige in person (not gold or yellow like it appears in the website photo as mentioned in other reviews), but that's why I bought it. I love the sandy beige color and that's what I was looking for. It does shed, but I've only had it a couple weeks so after a few more runs with the vacuum I think it will be fine. The rug is beautiful and I've gotten many compliments on it. I was thrilled when I received my two wool Persian type rugs. They came right away. They are very thick and soft. They are even better looking in person. Plus, they were a great deal. I wish all my online shopping experiences were so straightforward and satisfying. Thanks Overstock. This is an excellent value, to my suprise this rug is from a well know high end company. Hightly recommended. Amazing Rug! Goes with EVERYTHING. Great for kids and yet stays fresh and beautiful looking. Will fuzz up initially but after a few vacuuming sessions, it even's out. My favorite rug ever! Looks great. Still very fuzzy after 6 weeks and daily vacuuming. Do not follow the main image, this is definitely not as yellow/golden as photo appears. This is much more of a truer ivory background. Love the size and the price. Don't love the sallow color and unfading chemical odor. A beautiful addition to our living room. Went down easy with no creasing. Shedding is minimal after only two weeks. All in all, a wonderful purchase. Heavy carpet; I think is a "tufted" style, not woven flat style. Doesn't need a carpet pad. "Is this rug latex free?" This rug has a cotton canvas backing. Latex-based adhesive may be used on the backing. I needed these exact colors and size rug. "Thank you. Next question: others have stated that this rug is less gold (more cream or tan) than it appears on most computers. Can you comment on that?" We do not have the products on hand to inspect ourselves. We confirmed the color with the manufacturer and although some reviews say otherwise. The product review section shows several positive comments confirming the color. "The description says this rug is GRAY...?" Thank you for your attention. We have corrected the page. Safavieh Handmade Anatolia Oriental Tan/ Ivory Hand-spun Wool Rug - 9'-6" X 13'-6"